﻿ Mount Royal Park in Montreal Quebec. Mount Royal Park is a massive urban park located in the heart of Montreal Quebec. It was designed by Frederick Law Olmsted who also designed New York's Central Park. In addition to featuring a network of picturesque trails, Mount Royal Park is home to a chalet, artificial lake and the city's famous cross. 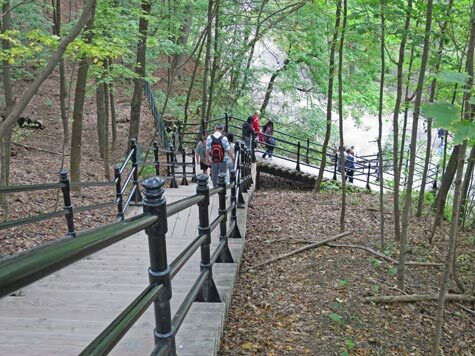 Visitors to downtown Montreal can climb a staircase and trail that runs up from the city centre (near the McGill University campus) to the Mount Royal Chalet. If you are visiting Montreal during the winter, you can enjoy outdoor skating on Beaver Lake. The best time of year to visit the park is in autumn, when the leaves are ablaze with colour.